My geraniums are very unhappy with this wild occurence. However, the little gnome is quite thrilled! So what does one do when snow falls in Autumn? Add some snow to celebrate the crazy weather! Snow in October? Wildly delicious! Advisory: Read this story in your best Southern accent!! Meet Jedidiah and Jasper, moonshiners from the backwoods of Kentucky. These days, Jed and Jasper are enjoying one another’s company somewhere down river. Wasn’t always like that though. You see, Jedidiah has been wandering in my head for months aching to come out into my world. Took me some time to arrange the visit. As the travelling began, it came to my knowledge that another moonshiner was roaming through the caverns of my brain, reaching out to me...well, at least I thought to me. When these two good ol’ boys finally arrived, a feud broke out as soon as they eyed each other. Imagine my surprise when Jasper exclaimed he was Jedidiah’s estranged brother! I watched as Jedidiah's eyes crinkled up with a hint of laughter. "I'll be durned! All these years, I guess I was making a mountain out of a mole hill." At that point, the two turned to me, tipped their hats, and said, "Thank you ma'am for your hospitality. We better be gitten along." A note: Knob Creek is in no way affiliated to these dolls or to the story. I just happened to like the shape of the bottles. I also think the bourbon that was in the bottles was the most delicious I have ever tasted. This morning I made my favorite pumpkin recipe, Pumpkin Cream Cheese Muffins. (I came across this recipe last year on Annie's Eats. Annie has a wonderful blog filled with all sorts of great recipes and neat party planning tips. If you enjoy food blogs, you should definitely check this one out!) I have made this recipe multiple times to the delight of myself and many other people. These muffins are amazing! The spices are bursting with every bite and the cream cheese filling is the perfect compliment to the pumpkin. An added bonus is the lovely aroma that lingers in your house for hours after baking these little wonders of joy! I am going to gloat a bit and say that I am very pleased with my latest baking endeavor. I love jelly rolls but the idea of making one from scratch intimidated me. When I saw Paula Deen's Pumpkin Roll in the latest issue of Food Network magazine, my mouth began to water. I decided that I would overcome my fear of "the roll" and go for it. I am sure glad I did! Paula's Pumpkin Roll is delicious! The cake itself is spongy and light. I enjoyed the cream filling with hint of rum and toffee pieces that provided just enough sweetness. I tried the cake with the caramel sauce and extra toffee pieces but I found the garnishes a little too sweet for my liking. The only negative thing I can say about this dessert is the roll became heavier and wet when it sat overnight but it still tasted fine. You should probably make and serve it on the same day. I am so happy that I conquered my fear and embraced "the roll". I can't wait to make another! I Really Do Make Dolls! ﻿A friend of mine pointed out to me the other day that my blog has become more about baking than doll making. I do apologize about that. I am more confident in my baking compared to my doll making so baking is my way of creating something fantastic rather quickly. Hence,my creative urges are quelled momentarily, and I can post pretty pictures of my treats for all to see. However, if you were to walk into my creative space, you would see various forms of dolls in process. I am never "not" creating! In fact, I am presently working on these two fellows. The guy on the left has been telling me for months that he wants out of my head. As he began to take shape, his brother showed up and wanted in on the action. Soon I will introduce them both to you along with their story. So while you are waiting, please continue to enjoy my sweet confections! Happy October! Happy Pumpkin time! It's happened! The first can of pumpkin has been opened in my kitchen. In honor of this momentous occasion, instead of the usual Sunday morning buttermilk pancakes, I made Pumpkin- Cinnamon Streusel Pancakes . These cakes are mouthwatering! 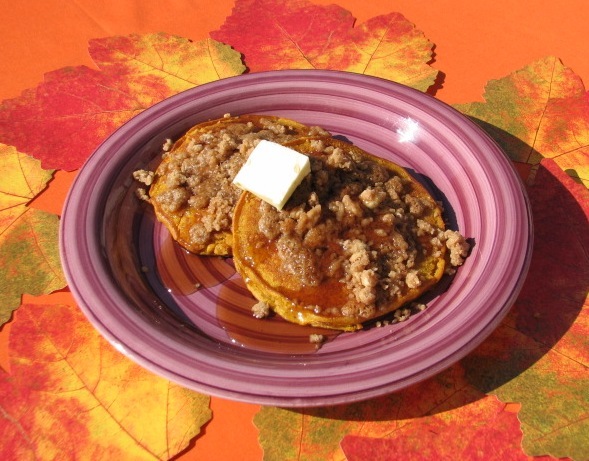 The pancakes are fluffy while the spices are complimented by the buttery sweetness of the streusel. When I made the first plate of pancakes, I didn't like the wetness of the streusel so for the rest of the batter, I placed the prepared cakes under the broiler for a few seconds. The streusel became a little crispier. Oh, one word of warning- these pancakes will cause you to be satisfyingly full. Eat on an empty stomach!! All photos are property of "The Doll Baker" and may not be reused without permission. I'm married to a wonderful man and have two incredible children. I also have two crazy cats. While I love my family madly, I've spent the past twenty years focusing on everyone else but myself. So this blog is about me and what I love to do best- baking treats and making dolls... and maybe a few other random thoughts.